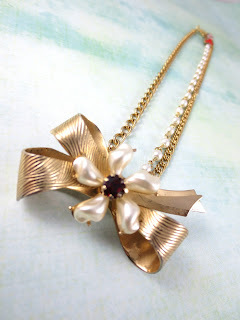 It's just a little before midnight, so this still qualifies for day 2 of the month-long daily listing of a new repurposed vintage necklace over at my little Etsy boutique... ResparkableVintage... right?! Right! I am seriously in love with this necklace!! This Coro Bow is fancy without being over the top. Just so very pretty. See more photos and get all the details right HERE. Hope you had a great day! Please check in tomorrow for Day 3!